The convergence of social, mobile and cloud technologies —“SoMoClo”—is changing the way companies work. No, it’s not the latest trendy neighborhood in New York City. “SoMoClo” is shorthand for a phenomenon that will have a lasting impact on business intelligence: the convergence of social media, mobile technologies and a cloud IT infrastructure. Credit Andrew Borg, research director for enterprise mobility and collaboration at Aberdeen Group, and his team for coining the term, if not for being the only ones who saw the significance of the trend. 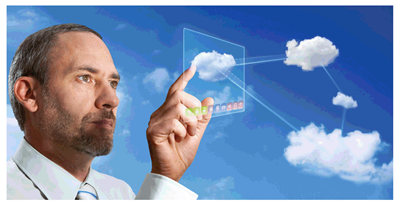 Picture SoMoClo this way: Everyone in the organization is connected to enterprise data and business applications via the cloud, wherever they may be—thanks to their mobile devices—and are sending business messages to each other on internal and external social media. “It’s today’s business reality,” says Borg. The benefits of this new reality are organizational agility, accelerated decision-making and increased collaboration. “Organizations that align their technology infrastructure according to the SoMoClo principles—cloud at the core, mobile at the edge and social as the connection from edge to edge through the cloud—are on an evolutionary path,” says Borg. 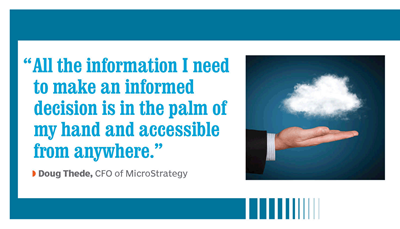 Doug Thede, MicroStrategy’s CFO, says SoMoClo is helping him fulfill his role as the company’s BI steward. “All the information I need to make an informed decision is in the palm of my hand and accessible from anywhere,” says Thede. “I don’t have to go to my desk to run a report. It’s all on my iPad and iPhone.” That information includes sales data (products in the pipeline, customer orders, bookings year-to-date, customer service utilization metrics) coming in from the field in real time; top customer rankings; outstanding accounts receivable; purchase-order requests in real time; and the status of job openings that need to be filled. Heightened agility and responsiveness to rapidly evolving market opportunities seem to be what companies want these days. According to a May survey of 930 CFOs by Accenture, 79% said access to information was a key factor that would make their organizations more agile, and 57% saw investments in Big Data and analytics as a source of competitive advantage. The same survey indicated that mobility is the top technology investment priority for the finance officers through the next three years. In another survey of more than 500 IT and business executives by CompTIA, the key driver for mobility adoption is “productivity gains,” cited by 62% of respondents. Both Boloco and TripAdvisor, the largest travel website in the world, feast on a wide range of information flowing to them from external social media. “Under my umbrella is HR, and we do a lot of recruiting through Twitter, Facebook and LinkedIn,” says Julie M. Bradley, CFO of TripAdvisor, which links 200 million unique monthly visitors to its website with more than 100 million (and counting) reviews and opinions of other travelers. “I can use my smartphone to catch up on which job postings remain open or what might be a new job position we’re looking for,” she says. What takes SoMoClo to the next level is that the information provided by both internal and external social media is transported to and from every employee’s mobile devices via the cloud—the “Mo” and the “Clo,” respectively. All of this sounds almost too good to be true—reaching 80 million people with a single tweet, instantly altering products to suit customer preferences, nailing big deals on the fly. “How do I know SoMoClo is vital to business? Because if you took it away tomorrow, people would scream,” says Borg. Indeed, all those workers already using an array of innovative business apps to conduct business from anywhere wouldn’t take the loss of SoMoClo lightly. At Coupa there are about 40 cloud-based apps in general use, notes finance chief Verbeck, many of them available on smartphones. Useful apps like Meeting Mapper, a meeting organizing tool; EchoSign, an e-signature solution; Workshare, which synchronizes files with mobile devices; and Fusebill, an automated billing and payments platform, are proliferating by the week. The very notion of “office” is becoming almost quaint in the SoMoClo world. Meanwhile, SoMoClo is making work more palatable, whether done in an office or out. “Most of us in business spend more time with our work colleagues than with our families, and we have found that SoMoClo builds a better atmosphere for work, helping retention and teamwork,” says Padraig Hayes, CFO of Enterasys Networks, a global provider of wired and wireless network infrastructure and security solutions. “We leverage a salesforce.com tool called Chatter that allows workers to communicate and collaborate on their mobile devices in the cloud, wherever they are at any time of the day. Russ Banham is a contributing editor at CFO.